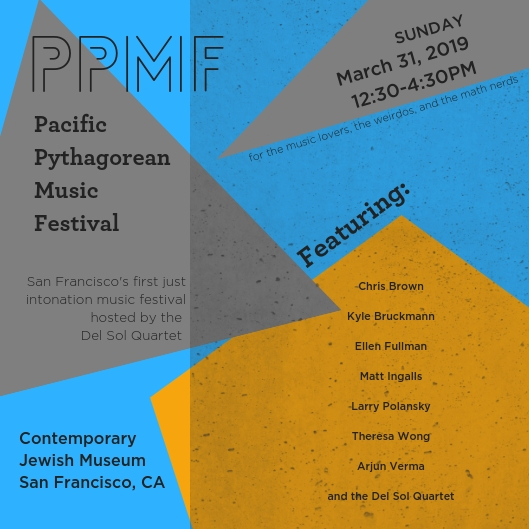 San Francisco’s first just intonation festival comes to the Contemporary Jewish Museum on Sunday, March 31, 2019. Come explore the world of natural resonance and pure ratios. …around the world tune musical intervals as whole number ratios of frequencies. The Pythagoreans did this, playing the monochord, a single-string instrument that generates simple divisions of the string to create music. Touch the string at ½, ⅓ or other fraction of the length, and you get tones that create beautiful resonant intervals. In Europe, the rise of the piano, designed to move between keys without being retuned, forced a compromise in this mathematically rational system. The Bay Area is the birthplace of American just intonation composition, from archetypal outsider artist Harry Partch to composer Ben Johnston, and continues to nourish this tradition. The Del Sol Quartet brings together the just intonation specialists of the Bay Area for a four hour festival in the soaring Yud Gallery at The Contemporary Jewish Museum. In this light-filled space built with acoustic resonance in mind, audiences can experience a whole range of music that can be made with keeping “rational numbers” in mind, from soulful variations of “Amazing Grace” to highly calculated avant-garde compositions to the improvised world of extended wind techniques. Music to be performed includes the world premiere of new quartet work by Michael Harrison and works by Ben Johnston, Ellen Fullman, Chris Brown, Larry Polansky, Matt Ingalls, Arjun Verma, Theresa Wong, and more. This first festival also launches a new commissioning arm of Del Sol Performing Arts Organization to produce future works in just intonation, including works to be premiered in 2020. Learn a little what Just Intonation is all about with this video!